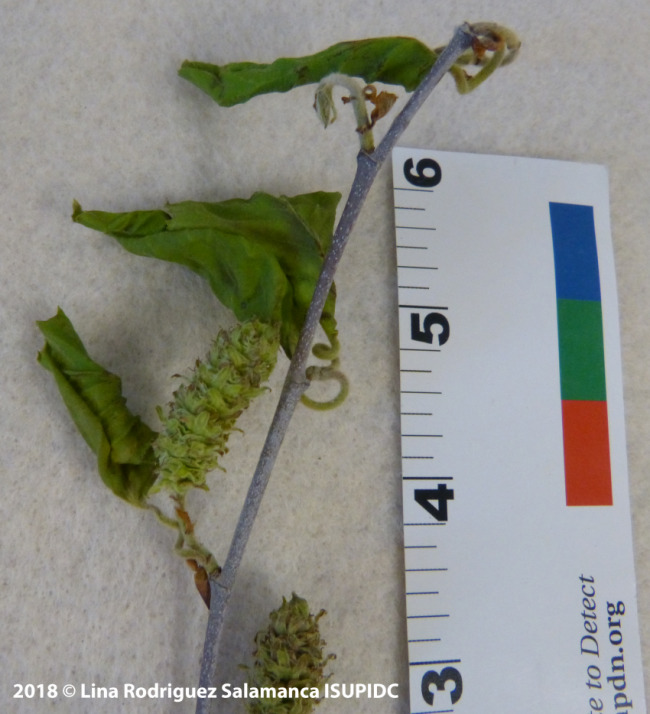 The ISU Plant & Insect Diagnostic Clinic has recently received several samples from trees with symptoms of leaf cupping, petiole twisting, and lack of tissue differentiation (epinasty and deformation). Some of these cases are consistent with symptoms typical of a chemical injury, specifically growth or hormonal disruption caused by certain herbicides. Herbicide injury symptoms can range from defined spots, blotches, and change of color to severe tissue distortion or plant death. Unfortunately, some of these types of symptoms can also be caused by pathogens (viruses, bacteria, and fungi) and can be easily confused with diseases. The ISU Plant and Insect Diagnostic Clinic can help identify damage caused by diseases and insects by inspecting a sample for evidence (signs) of the culprit, and running laboratory tests. On the other hand, investigating abiotic (noninfectious) disorders or conditions can be more challenging as we are not equipped to test for chemical residue on plants. Since we DO NOT test for pesticide or chemical residue, we can only provide a visual assessment that relies on symptomology. We can provide a list of laboratories within the United States that offer chemical residue analysis. Plants may be exposed herbicides, through the following ways: 1) contaminated wood mulch from tree stumps treated with herbicides; 2) products applied to the lawn or landscape where trees and ornamental plants are growing, and 3) improper use of a product. Proper mulching of trees, especially young trees, is essential for retaining moisture in the root-zone. In some cases, trees, stumps, or brush may be treated with herbicides, and if this wood is later chipped/shredded and used for mulch, herbicide residue on that mulch can injure ornamental plants in the landscape. Herbicides used to manage weeds in lawn areas may occasionally injure trees and ornamental plants growing nearby. See the case "Effect Metsulfuron-Methyl-Containing Herbicides on Ornamentals". Because grass clippings could be contaminated with herbicide, avoid using those clippings as a mulch near trees, woody and/or herbaceous ornamental plants, or gardens. Chance of herbicide injury to landscape plants can be lessened by carefully reading the product herbicide label and using the product as directed by the manufacturer. Herbicide labels have warnings and restrictions that must be followed. Drift can be avoided by monitoring wind speed and direction right before and during application and using appropriate, clean spray equipment. Many herbicide labels warn against product use when wind speeds reach a certain threshold. To prevent herbicide injury to trees and ornamental plants, only use mulch (wood chips, shredded bark, etc.) from a trusted and reputable source. If using herbicides on your lawn, read and follow label directions, making sure spray equipment is properly cleaned to avoid sprayer contamination. If the lawn is treated, grass clippings should not be used as mulch. When managing weeds nearby the roots of woody plants, consider hand weeding underneath the branch spread of the plant or apply safe mulch (free of herbicides) in the area to help manage weeds. Herbicide injury to the foliage of a birch tree. Special thanks to Dr. Iles and Dr. Hartzler for reviewing this article. Links to this article are strongly encouraged, and this article may be republished without further permission if published as written and if credit is given to the author, Horticulture and Home Pest News, and Iowa State University Extension and Outreach. If this article is to be used in any other manner, permission from the author is required. This article was originally published on June 8, 2018. The information contained within may not be the most current and accurate depending on when it is accessed. How do I prevent desiccation injury to my yews and boxwoods?